The Aficio MP 4000 is a feature-rich digital system that maximizes productivity with advanced network printing, a large 8.5 simplified color display, Super G3 faxing, and output speeds of 40 pages per minute. All of this and more available in one efficient, cost-effective platform. 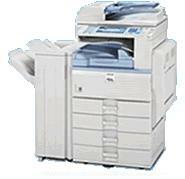 Stackless Duplex Unit creates two-sided copy, print and fax output"cutting paper, filing and postage costs in half.